Mamidipappu pesarapappu pachadi is a classic culinary delight of Andhra. Telugu speaking folks love pachadis, period. Visit any Andhra restaurant and you are sure to be served an assortment of pachadis and podis as part of a thali meal. Today, am sharing an original, traditional chutney made with raw mango and moong dal that is to die for. It is a typical summer recipe and made during the mango season. A healthy, rustic chutney that’s rich in protein, Vitamin C, antioxidants, and nutrients. It is aesthetically delightful with a gorgeous orange color, texture and flavor. Less is more here. Minimal spices yet high on flavor. It is amazing how three to four ingredients can combine together to bring out an eclectic flavor. Dry roasted yellow moong dal, cumin, and red chilies are ground to a coarse paste along with peeled raw mango and jaggery. The sour mangoes, the sweetness of jaggery, the earthiness of lentils and the heat from the chilies merge to create enticing flavors. The sour, spicy and subtle sweet tones of the chutney make it addictive. Roasting of moong dal is the only time-consuming part but is essential for the enhancement of flavor. The tempering of mustard seeds, split urad dal, asafoetida, and fresh curry leaves lend a sizzling touch to the vegan chutney. A quick green mango chutney that makes for a delicious and spicy accompaniment to rice with a dollop of ghee and sliced onions. It will also work like a dip similar to hummus. 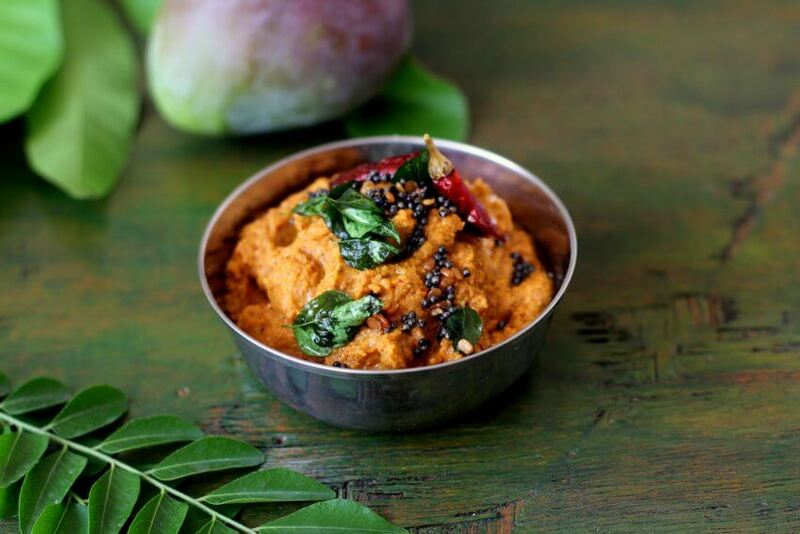 Mamidikaya pesara pappu pachadi is a vegetarian culinary gem of Andhra cuisine and if you are a fan of Andhra food and khatta (sour) taste, you should try raw mango moong dal pachadi this mango season. 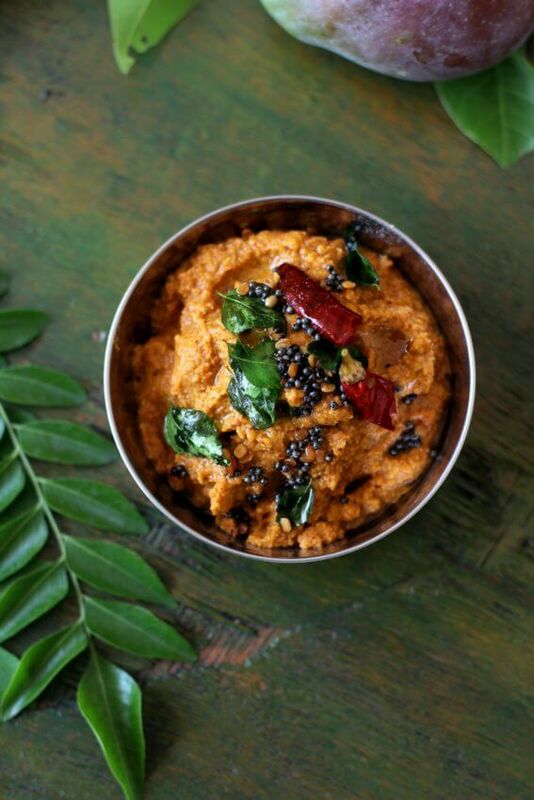 Definitely, one of the best South Indian style pachadi recipes out there. 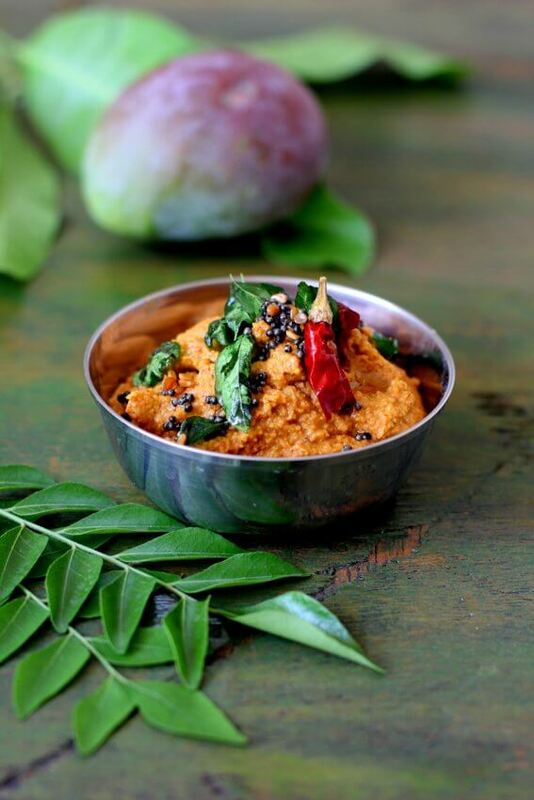 You can look forward to another healthy version of this pachadi where soaked moong dal is ground with raw mangoes. Dry roast moong dal in a pan on low flame till it turns red. Do not burn it. Remove and set aside to cool. Next dry roast the cumin for 3 mins on low heat, add red chilies and roast for less than a min. Remove and set aside to cool. Grind the roasted moong dal, red chilis and cumin to a coarse powder. Add the chopped raw mango pieces, salt and jaggery to a slightly coarse paste adding very little water. Remove to a serving bowl and prepare the tempering. Heat oil in a small pan, once hot, add mustard seeds and allow to splutter. Add the split urad dal and allow it to turn red. Add the red chilies, curry leaves, and asafoetida, saute for few seconds and turn off heat. Pour this tempering over the chutney and serve with steamed rice and a dollop of ghee. The pachadi should have a slightly coarse texture with a bit of crunch from the dal. Do not use a very sour mango. Use a mango which is less sour. Jaggery is added to balance the sourness of the mangoes. 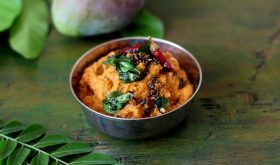 By Sailu Published: April 22, 2016 Mamidikaya pesarapappu pachadi, a tasty Andhra style chutney using raw mango, moong dal & red chilies. One of the best pachadi recipes among telugu vantalu. 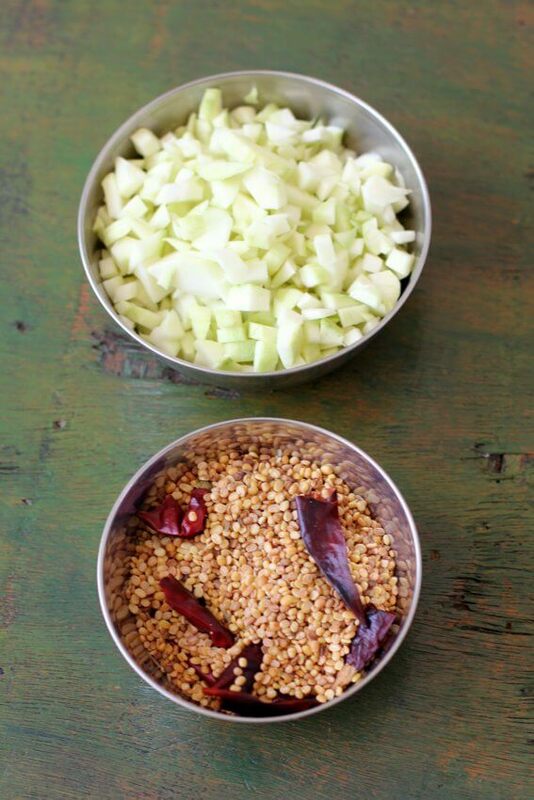 Sailu, Do you wash the moong dal before roasting? Or do we not wash it at all in this process? Hi Sailaja ma’am, I didn’t have raw mango but really really wanted to try out this recipe so used raw amla(nallikaya pieces) for the sourness and the chutney was just yummy with rice and ghee 🙂 :-). Thank you for posting such varieties of chutneys!! Being half Telugu myself, I’m enjoying the pachchadis on your blog. Thank you! You are true inspiration andi, have started posting my dishes as well seeing you.